123 Ink Cartridges for sharp true colour printing and amazing value with same day despatch ! We also fly deliveries to Europe and Worldwide from the UK. Compatible inkjet cartridges can be exchanged or refunded within 7 days of purchase if the condition of the packaging is as new and the cartridge is unused. The customer is responsible for shipping charges when returning cartridges that are not defective for a refund. Refunds maybe subject to sales fees incurred and p&p if supplied correctly. Any defective compatible inkjet cartridges can be replaced within 1 Year of purchase through our Free Returns Guarantee, 1st class postage costs will be refunded. Please contact our support team for assistance and RMA Returns number. Refunds will not be given to any opened or used cartridges, but will be exchanged if the cartridge is found to be defective. Please contact customer support for any assistance with any cartridge. Customer is responsible for shipping charges when returning cartridges that are not defective for a refund. 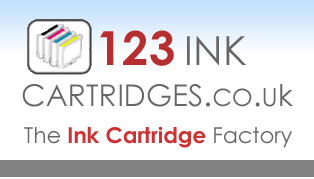 Based in Nottingham, Uk - 123 Ink Cartridges is your one stop website to cater for all your ink needs. We offer expert advice that helps you make the right choice in getting the right product. Please take the time to browse our website, you are sure to find what you are looking for. If you have something particular in mind and can't find it on our website then please let us know by contacting us. All pictures are for illustrative purposes only and do not represent the exact products.